The second fiscal shoe to drop. Solvency or not? 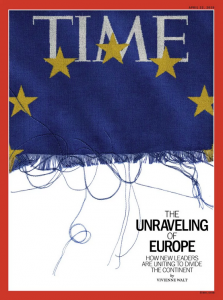 How Nationalists Are Joining Together to Tear Europe Apart. Moves to help low earners in election year test economic orthodoxy; increasing prices and spending power. Evangelia Koskina just received her first pay increase in six years, but she worries that it could be bad news for the café where she works. Greece, like fellow euro member Spain, decided this year to sharply increase the minimum wage, despite the legacy of high unemployment left by Europe’s long debt crisis. In both countries, left-leaning governments are betting—against economic orthodoxy—that such increases will be good for growth and employment, as well as for their voter support. The minimum-wage increase, Greece’s first in nearly a decade, takes Ms. Koskina’s monthly pay to €650 ($731) from €586. It still isn’t enough for the 25-year-old to move out of her parents’ house, but she says she can finally afford driving lessons. “But I know that my boss can hardly afford the rise for me and my three colleagues,” she said. 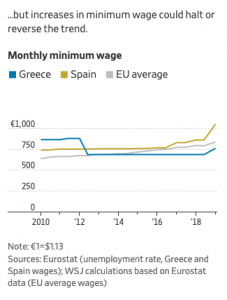 “He will have to raise prices for the first time in years to offset part of the loss.” While Greece has raised its minimum wage by 11%, Spain has raised its €736-a-month minimum wage by 22%, to €900. Critics say a higher minimum wage is the last thing these economies need, when millions are still struggling to find work after an economic depression. 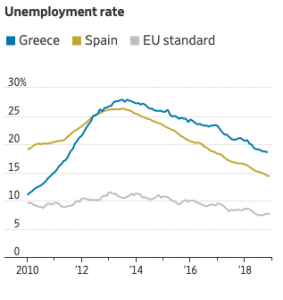 The unemployment rate has been falling recently, but remains at 14.1% in Spain and 18.5% in Greece, compared with 3.2% in Germany and 3.6% in the Netherlands, according to Eurostat’s January 2019 unemployment figures. The eurozone’s unemployment average is 7.8% and the European Union’s 6.5%. “An abrupt increase in the minimum wage could put a halt to, or even reverse, the current downward trend in unemployment. Brexit Kicking Off An EU Financial Crisis? Slowing Birthrates Weigh on Europe's Weak Economies.